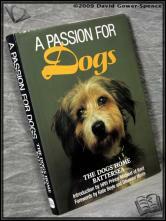 A Passion for Dogs ANON. A Passion for Dogs - ANON. David & Charles, 1991, Hardback in Dust Wrapper. Condition: Very Good - in Very Good DJ. DJ slightly ruffled at the edges, nicked at he head of the spine. Foreword or introduction by Katie Boyle & Desmond Morris. Size: 10½" x 7¾". Grey boards with Gilt titling to the Spine. 208 pages.